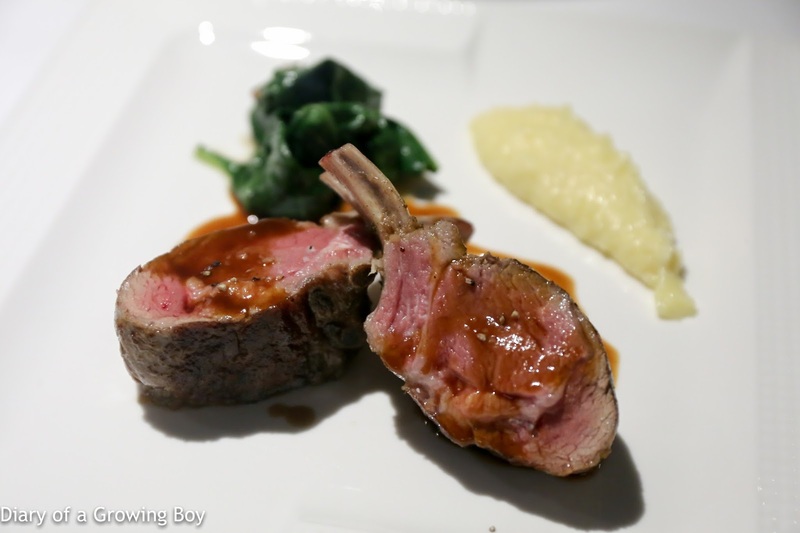 Carreˋ d'agnello cotto all'aglio e timo con spinacini saltati e polenta al Taleggio - I know that our senior waiter/manager had suggested that we split our dishes into two batches, but I still don't understand why he thought the lamb chop should be served in the first batch, before a bunch of primi piatti. Well... at least it was tender and pretty decent, even though it had gotten a little cool by the time the Specialist got herself a glass of the red Burg... as she insisted before taking a bite of the lamb. Oh and this is where we get our WTF moment of the evening. One of the bowls still had a lobster claw left untouched, and somehow our over-eager manager figured that we must not want it anymore. We stared in stunned silence as he nonchalantly whisked it away. It took a couple of minutes for us to get his attention again to tell him that we wanted it back. Sigh... If you're in service - even if you were working in a casual cafe - you NEVER, EVER take plates away from a customer without asking first. 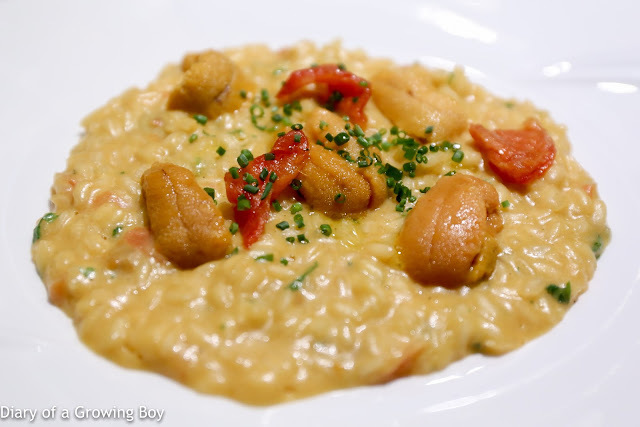 Risotto mantecato con i ricci di Hokkaido, wasabi fresco e erba cipollina - this was very good, and the sea urchin was definitely creamy and sweet. I guess I should have read the menu a little more carefully and tried to pick out the fresh wasabi (山葵)... because it didn't hit me at all. Mrs. Birdie loved the dish - no surprise since there's sea urchin here - because the rice was more al dente. 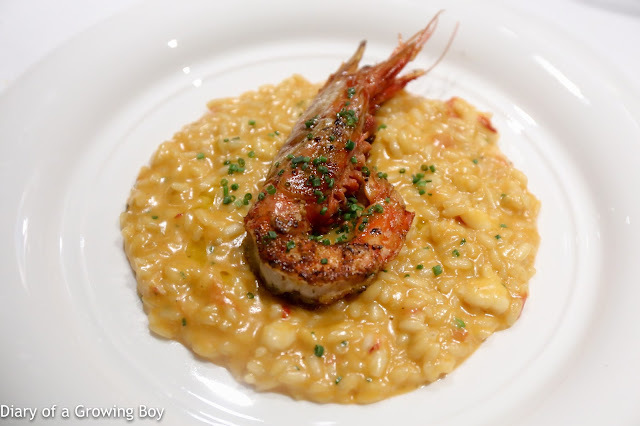 Risotto "Acquerello" mantecato di gamberi rossi di Sicilia e carabineros con pomodorini pachino - there was never any chance of me passing up a dish with carabineros in it, and here Chef Angelo had diced up Sicilian gamberi rossi and cooked them in the rice, then served up a nicely grilled carabinero on top. Very yum. I could come and have two plates of this and nothing else. 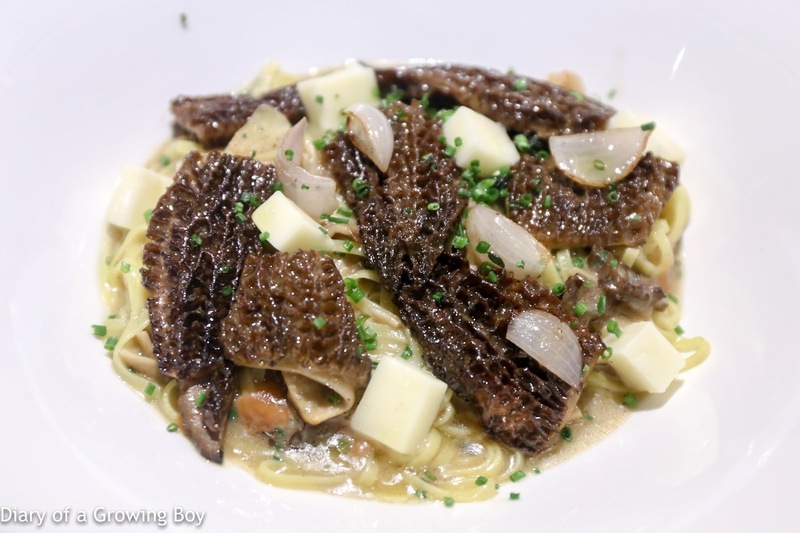 Homemade tagliolini with morel mushrooms - morels are in season so we ordered this simple pasta. 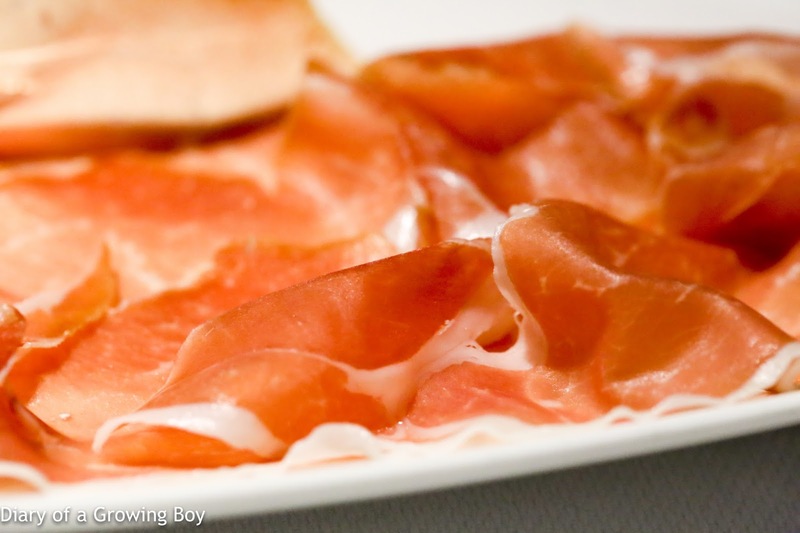 Pretty nice when you've got delicious and fresh ingredients. 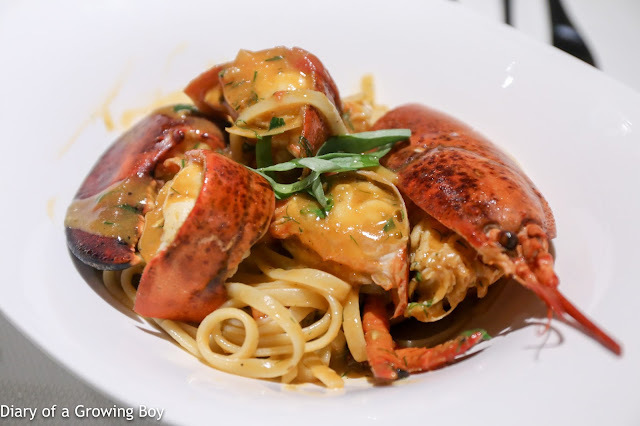 Spaghetti "Mancini" all'aglio, olio, peperoni secchi e bottarga di branzino di lenza - I love me a simple "aglio olio" pasta, especially when you've got shaved bottarga from a line-caught seabass. 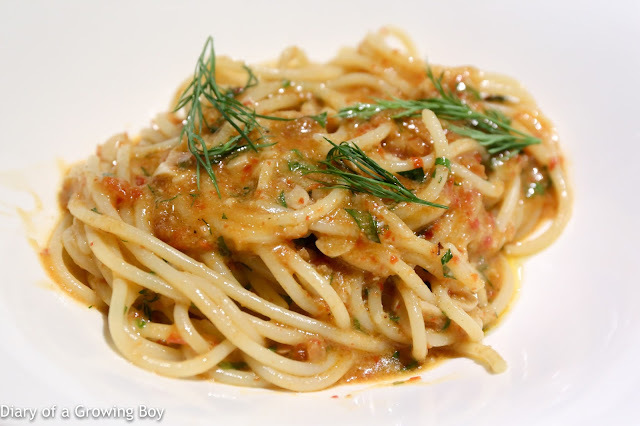 Yes, this was on the salty side, but that's what you get when you put bottarga in your dish... and I love it! Tagliolini freschi all uovo con scampi, cipollotto e pomodoro confit - this was pretty good, too. 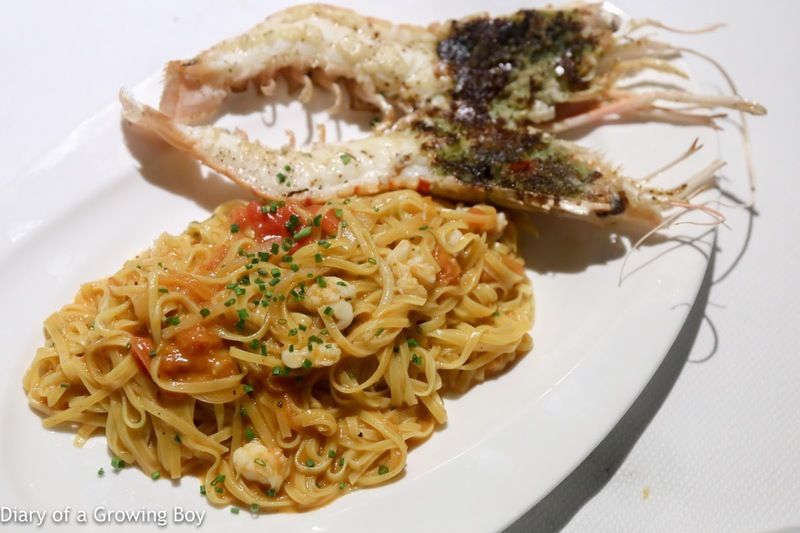 In addition to the soft and tender langoustine on the side, there was also some diced langoustine mixed into the pasta sauce. Simple and delicious. 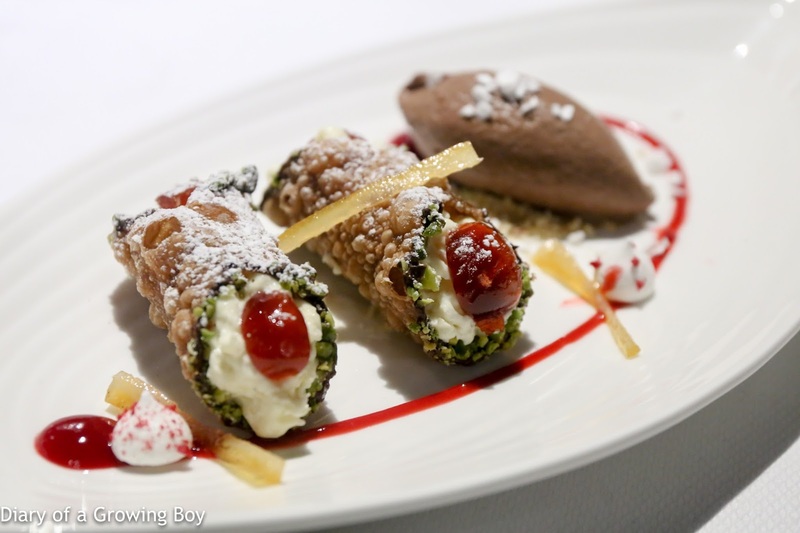 Cannoli di Ricotta, pistacchio e frutta candita - I saw a picture of this that Da Jam had posted, and decided that it's been too long since I last had a cannoli. Pretty good, but I don't think the chocolate ice cream (or was it gelato?) on the side was necessary. 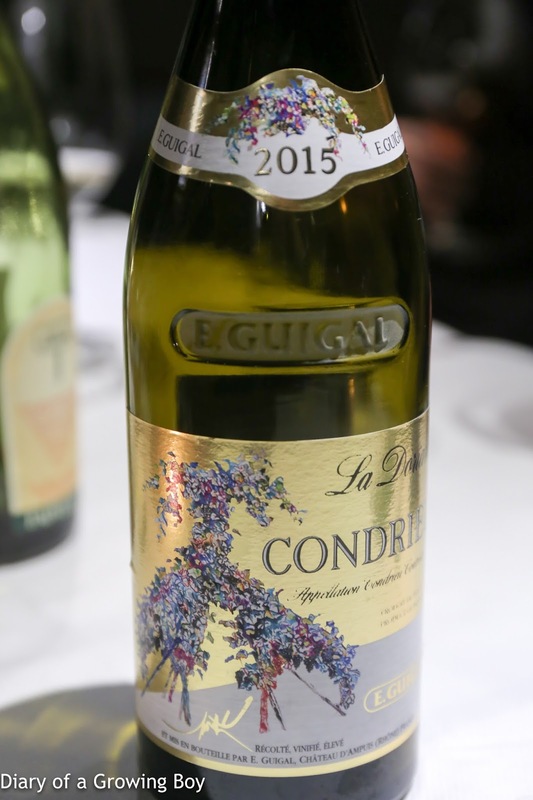 The candied citrus peel and cherries did a nice job of adding sweet and fragrant touches to this. 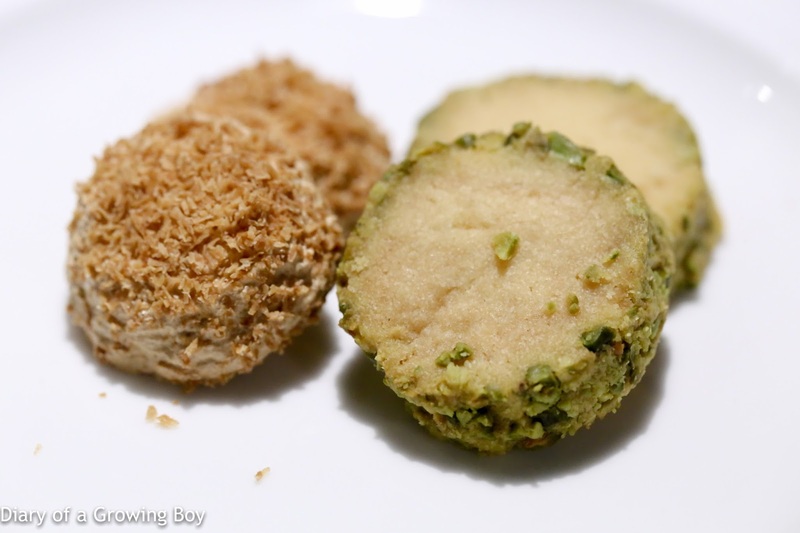 The petits fours came in the form of cookies - sweet ones with desiccated coconut on top on the left, and savory ones made with Parmesan and pistachio on the right. In my (slightly) buzzed state, I declared that the Permesan cookie was the best thing I tasted all evening. 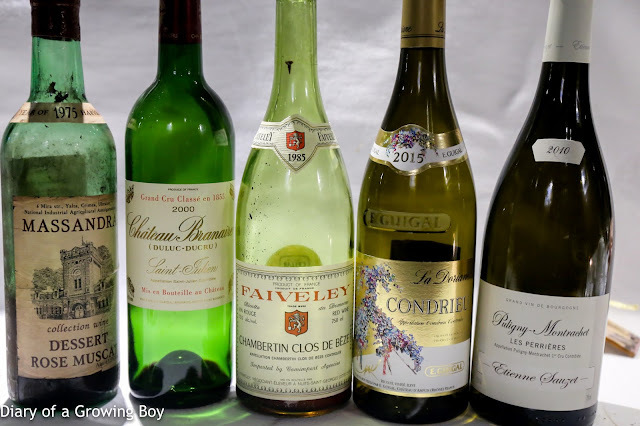 Yes, it was an exaggeration... but also shows that my palate could still be impressed by something seemingly so simple - yet so pure. I did say in the first sentence up top that this was a dinner with the Alcoholics, right? That means a casual evening - where the Specialist decided that we didn't need to consume 1 bottle per head, and telling me that "no need to be too serious" - turned into something slightly different... We ended up ordering 3 bottles from the restaurant's relatively reasonably-priced and well-thought-out wine list, plus opening two bottles that we brought along. 2010 Sauzet Puligny-Montrachet 1er Cru Les Perrières - nice acidity here. Flinty with a little lemon on the nose. 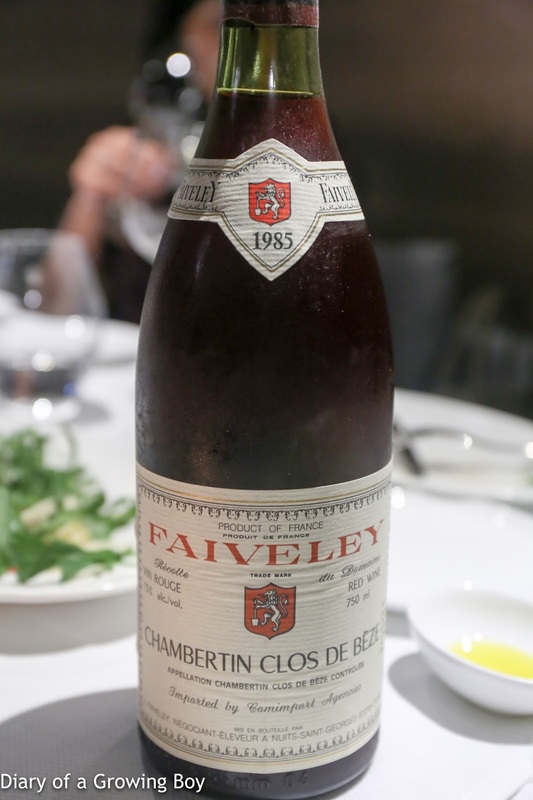 1985 Faiveley Chambertin Clos de Beze - served without decanting. Very clean, with sweet fruit and a little leather. Nice and mature, very smooth. 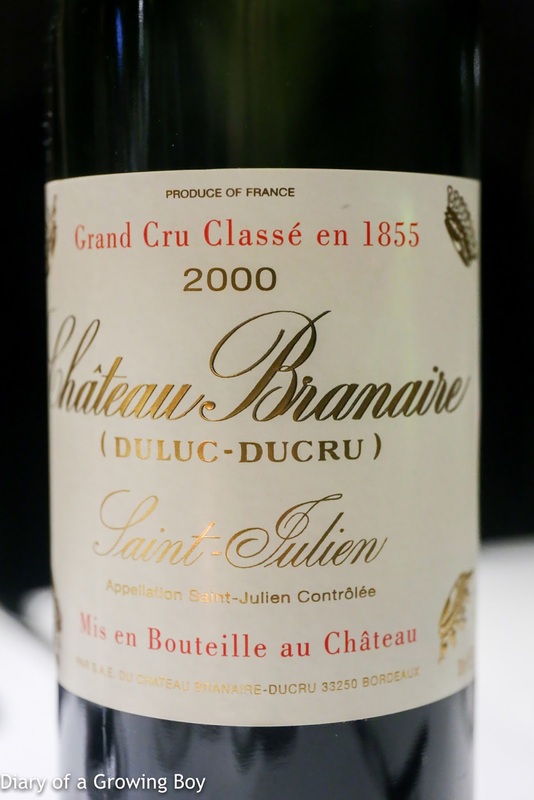 2000 Branaire-Ducru - smoky with leather notes. Solid with no surprises. 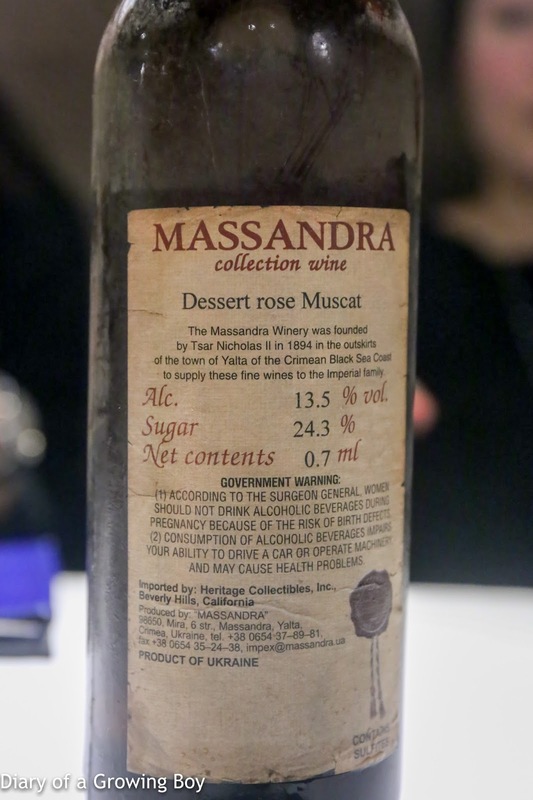 1975 Massandra Rose Muscat - having tasted some of Massandra's dessert wines before, I knew that this was gonna be deathly sweet. 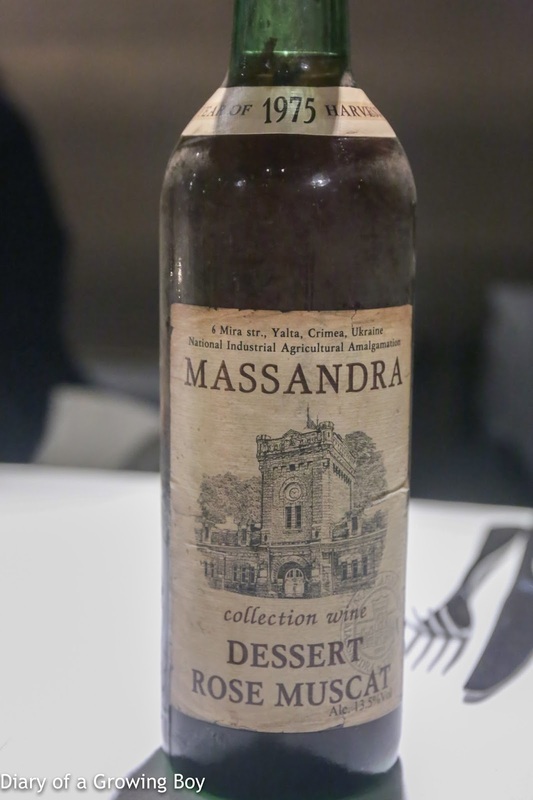 At 24.3% sugar, this has easily 50% more sugar than something like Yquem... Pure honey and sugarcane, with a hint of savory notes like salty plum (話梅).